New penalties will apply to drivers of all heavy vehicles and buses who use the South Eastern Freeway down-track into Adelaide from 1 May 2019. A vehicle is a heavy vehicle if it has a Gross Vehicle Mass (GVM) of more than 4.5 tonnes. A motor vehicle built to carry more than 12 adults including the driver is classified as a bus. not exceed the applicable speed limit. While trucks and buses are limited to a maximum speed of 60km/h on the South Eastern Freeway down-track, speeds may be further reduced via the variable speed limit signs or other temporary speed limit signs at any time as required to maintain safe travel. This may include inclement weather, reduced visibility or as a result of a crash, roadworks etc. three year licence disqualification for subsequent offences. Where convicted by the court, a first offence will attract a maximum fine of $5,000 plus six demerit points plus a licence disqualification of not less than 12 months. Subsequent offences will attract six demerit points, a licence disqualification of not less than three years and up to two years imprisonment. These penalties apply only to low gear and speed offences committed by trucks and buses on the down-track of the South Eastern Freeway from Crafers to the intersection of Portrush, Cross and Glen Osmond Road. vehicles not registered as a bus which have an adult seating capacity greater than 12, including the driver. call Service SA on 13 10 84. The South Eastern Freeway forms part of the Adelaide to Melbourne road corridor and is an important strategic freight route for South Australia. The down-track is a sustained continuous gradient which ends with traffic lights at one of Adelaide’s busiest intersections. 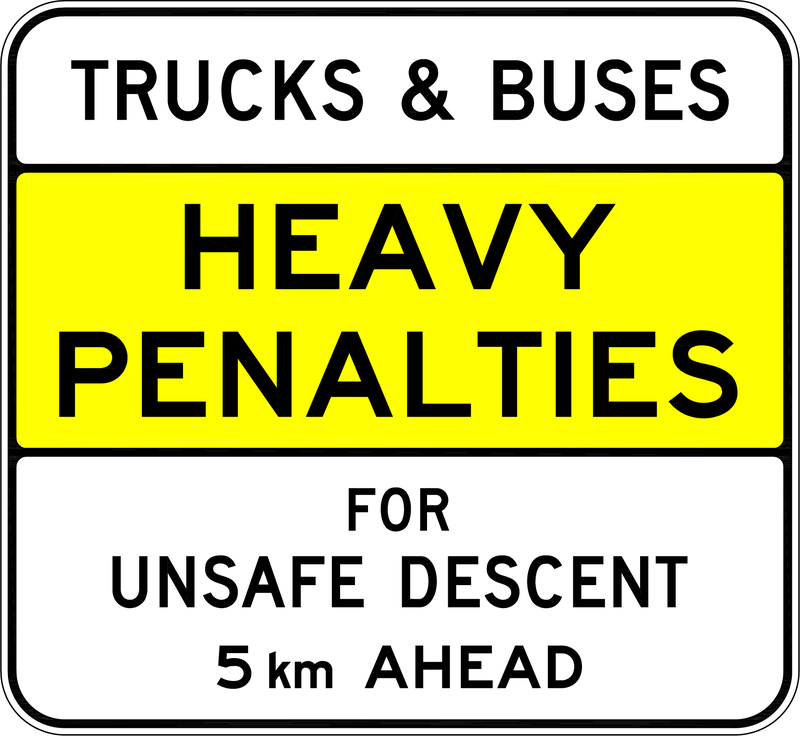 This presents heavy vehicle drivers with unique and significant challenges rarely encountered on other descents across Australia. The South Eastern Freeway down-track is from Crafers to the intersection of Portrush, Cross and Glen Osmond roads (as per map below). Speed cameras operate along the section of the South Eastern Freeway where the new legislation applies. These cameras are operational and drivers can be penalised for road safety offences at these sites. Fixed signs will be installed in the lead up to the down-track to remind drivers to descend safely and avoid heavy penalties. These advisory signs, as well as speed limit and low gear signs that refer to ‘Trucks & Buses’ apply to drivers of all heavy vehicles. 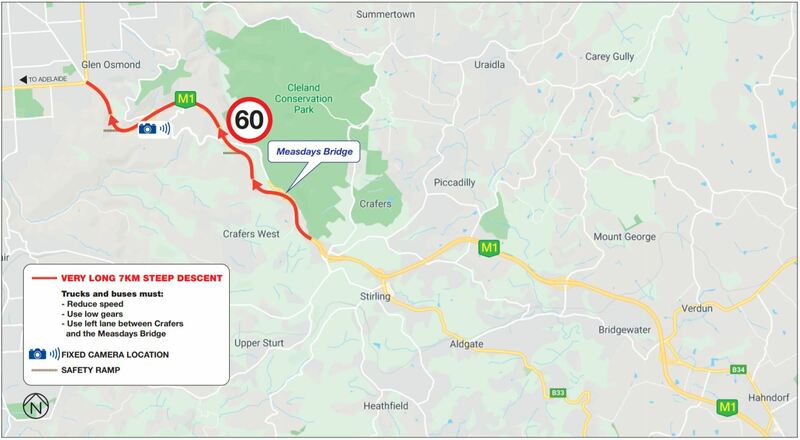 In 2018, the South Eastern Freeway down-track between Crafers and the Mount Osmond interchange carried an average of 25,000 vehicles per day, with 2,200 classed as heavy vehicles. In 2010 and 2014, two serious crashes involving out-of-control heavy vehicles on the South Eastern Freeway down-track resulted in fatalities and other serious injuries, and prompted a South Australian coronial inquest. Since late 2014, a maximum speed limit of 60km/h has applied to all trucks and buses between the Crafers Interchange and the bottom of the freeway. In response to the inquiry, two new offences have been created, which resemble existing Australian Road Rules but are associated with significantly higher penalties when committed on this stretch of road. The new legislation aims to improve road safety on the SE Freeway by influencing driver behaviour, thereby reducing the number of preventable heavy vehicle casualty crashes involving brake failure and excessive speed. The new legislation will see a substantial increase to the body corporate levy which will apply to businesses who fail to nominate the driver responsible for a speeding offence as detected by a safety camera on the South Eastern Freeway down-track. This levy will increase from $300 to $25,000. Where a driver is not nominated and the body corporate is found guilty of the offence by a court, a fine between $25,000 and $50,000 will apply. A body corporate that successfully nominates the responsible driver will not incur the body corporate levy.